Thermal insulation in air conditioning system is primarily used to reduce heat gain or heat loss from piping. Other factors include preventing the icing of water vapor and condensation on cold surface. Water vapor from the air or surrounding area must be kept from entering the cold side of the pipe to prevent condensation of moisture from the air on the outside of the cold piping. Condensation can cause damage to surrounding areas such as carpet or other furnishing. Hence, the insulation must also acts as a vapor barrier. 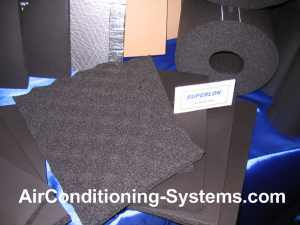 Insulation material for HVAC applicaitons. It also helps to reduce the noise level, absorb the vibration generated by the system, prevent the spread of fire and adding structural strength to the walls or ceilings. Well chosen material can also protects the piping being insulated from harsh environmental conditions such as UV light, salt, water, dusts, chemicals and oil. Other characteristics may include the ability to inhibit the growth or viruses, bacteria and fungi. Resistance to Fungi such as one that is based on ASTM G21 standard. Does not deteriorate or rot over time. Pipe insulation materials can be manufactured from rubber, wool, glass fibers or cork. The polyurethane or P.U. is a synthetic material that is commonly used these days due to its low thermal conductivity and other good properties. Cold Line is insulated to prevent any air leakage into the insulation that can cause condensation of moisture in the pipe. Suction Line is insulated to prevent the loss of capacity or sweating due to heat gain. Heat gain causes extra load to the condenser hence reducing the overall capacity of the air conditioning system. Liquid Line does not require any insulation as it is at a higher temperature than the surrounding air. Heat loss to the surrounding air is desirable as it improves the system capacity. Discharge Line does not require insulation because loss of heat removes load from the condenser. This helps to improve the performance of the compressor. 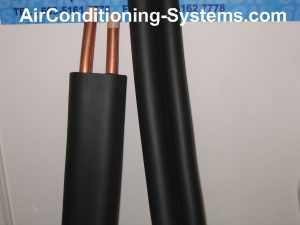 Find out the types of copper tubes that are used in air conditioning and refrigeration.